Eternal Orthodox Church calendar for the 26.11 year 2017. He was born in Antioch in the year 347, his father"s name being Secundus and his mother"s Anthusa. Studying Greek philosophy, John became disgusted with Hellenic paganism and turned to the Christian faith as the one and all-embracing truth. John was baptised by Meletius, Patriarch of Antioch, and, after that, his parents were also baptised. After their death, John became a monk and began to live in strict asceticism. He wrote a book: "On the Priesthood", after which the holy Apostles John and Peter appeared to him, prophesying for him great service, great grace and also great suffering. When the time came for him to be ordained priest, an angel of God appeared at the same time to Patriarch Flavian (Meletius"s successor) and to John himself. When the Patriarch ordained him, a shining white dove was seen above John"s head. Renowned for his wisdom, his asceticism and the power of his words, John was, at the desire of Emperor Arcadius, chosen as Patriarch of Constantinople. He governed the Church for six years as Patriarch with unequalled zeal and wisdom, sending missionaries to the pagan Celts and Scythians and purging the Church of simony, deposing many bishops who were given to this vice. He extended the Church"s charitable works, wrote a rite for the Holy Liturgy, put heretics to shame, denounced the Empress Eudoxia, interpreted the Scriptures with his golden mind and tongue and left to the Church many precious books of sermons. The people glorified him; the jealous loathed him; the Empress twice had him sent into exile. He spent three years in exile, and died on Holy Cross. Day, September 14th, 407, in a place called Comana in Armenia. 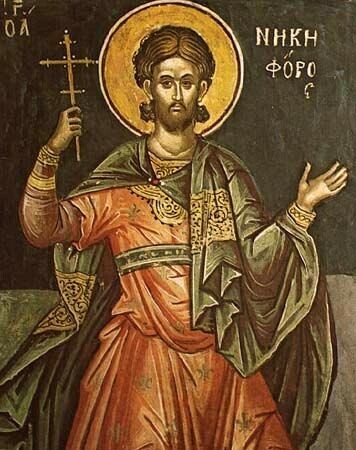 The holy Apostles John and Peter again appeared to him at the time of his death, and also the holy martyr Basiliscus (see May 22nd), in whose church he received Communion for the last time. "Glory to God for everything!" 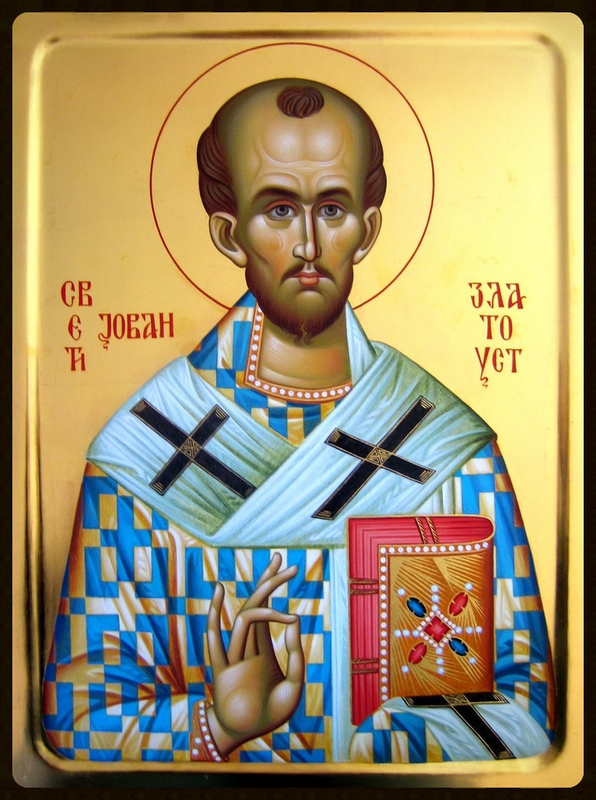 were his last words, and with them the soul of Chrysostom the Patriarch entered into Paradise. Of his relics, the head is preserved in the Church of the Dormition in Moscow, and the body in the Vatican in Rome.